Mikhail Ivanovich Glinka: Nocturne in F minor "La Séparation"
A few years ago, Valentin Silvestrov's fame got a boost with the release on Sony Classical (SK66825) of his Symphony #5, a work written between 1980 and 1982. This symphony seemed to spend its entire 45-minute length coming to an end, but not quite getting there. Commentators found themselves having to coin new metaphors to describe Silvestrov's dreamy, cloudy, wound-down, post-everything music, and they still do. Silvestrov himself enters the fray by using words such as "weak" (not pejoratively) and "metaphorical" to characterize his work. In essence, Silvestrov builds long, static structures out of the gestures and symbols of Romantic music, but almost entirely rejects the intense need of most Romantic composers to engage in direct communication with the listener. Background becomes foreground. It is for this reason that Silvestrov's music has been called "meta-music." To call it "autistic" – but beautifully so – would not be wide of the mark either. Silvestrov's titles speak for themselves. There are at least four works with the title "Postludium" or "Postlude." There's also a "Post Scriptum." Clearly Silvestrov is a composer in whose end is his beginning! 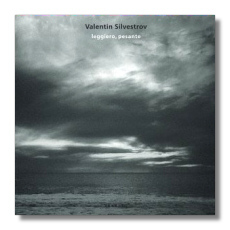 leggiero, pesante (roughly, "lightly, heavily" – sometimes used to modify tempo indications) is devoted to a handful of Silvestrov's chamber works written between 1974 and 2001. The music is similar in style to the "metaphorical" Fifth Symphony. Elusive cradle-songs from the forgotten Romantic repertoire seem to flutter past one's ears like ash from the explosion of an atomic bomb. With few exceptions, the pace is slow, slower, slowest. The Sonata for Violoncello and Piano (1983) does allow some nervousness from obsessive triplets in the piano's bass, but even here, the impression given is more consistent with final twitchings than with new life. Nevertheless, it holds me fast for its entire 22-minute span. The Three Postludes (1981-82) were written for various instruments: #1 ("DSCH" – an allusion to Shostakovich as well as to a series of four musical notes) is for piano trio and soprano, #2 is for solo violin, and #3 is for cello and piano. Originally, Silvestrov didn't intend for these three Postludes to form a cycle, but since composing them, he has welcomed the idea. If there is a thematic linkage between the three, it is hard to discern, but there's no missing the stylistic and emotional linkages. Hymn 2001, performed here by the composer, almost sounds like a classic pop song played very slowly by a pianist who lives several doors down the hall. The recording sessions took place in Frankfurt am Main in January 2001. As they occurred in the presence of the composer, I assume the performances are definitive. The musicianship is gorgeous, and Maacha Deubner (heard on an earlier ECM New Series disc of music by Kancheli) really is something to hear. 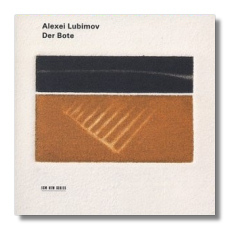 Alexei Lubimov has championed Silvestrov's music elsewhere, and so it is not surprising to see two more of his works appearing on Der Bote ("The Herald" or "The Messenger"). In fact, the entire collection is named for the final work on this disc, Silvestrov's thoughtful if tranced-out entry into the world of Mozart. Might this Bote be the shadowy messenger who came to Mozart's door, not long before the composer's death, to request a requiem mass? Over two centuries separate the earliest and latest works on this CD. Lubimov is less interested in contrasts than in similarities, though. In fact, like Silvestrov, he is in search of a never-ending song of endings, an elegy for and of elegies. Silvestrov's Der Bote seems to wrap-around into C.P.E. Bach's F Sharp minor Fantasy, the work that opens this disc. Pop this CD in your button and hit the "repeat" button. Make that "repeat… indefinitely." The elegiac carpet that Lubimov weaves extends into infinity. As I heard this disc for the first time, a surprise awaited me. Liszt's Abschied, although I didn't immediately recognize the title, is something I used to play on the piano when I was in junior high. Supposedly based on a Russian folksong, it is Liszt at his simplest and most transcendental. To whom – or to what – is Liszt bidding farewell? Lubimov's generous use of the sustaining pedal and the reverberant recording venue (Radio DRS in Zürich) wraps this program – again, slow, slower, and slowest – in romantic mists. Didacticism disappears into a foggy landscape. His tone is jeweled and his touch always poetic; he makes little effort to vary it in the name of stylistic authenticity. I'm sure that's precisely what Lubimov intended. This could be one of the great late-night listening CDs in your collection.